December 8, 2017: “PenFed Credit Union Announces $100,000 In Donations to Eugene Charities In 2018” by PenFed Credit Union. 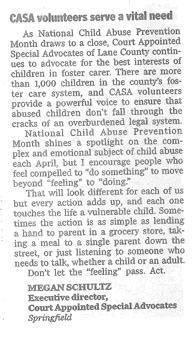 May 1, 2017: “Child & Youth Services Volunteer Helen Lucas” by The Register-Guard. March 18th, 2017: “Court Appointed Special Advocates work to keep up with demand of kids in need” by KMTR. March 17th, 2017: “Former Oregon Football Player Brings in Thousands of Dollars to CASA of Lane County” by KEZI. January 9th, 2017: “Support CASA of Lane County at their annual Casino Night” by KEZI. September 5th, 2016: “Car show in Elmira raises funds for CASA of Lane County” by KVAL. April 7th, 2016: “Court advocates give vulnerable kids a voice” by Hallie Edwards for The Register-Guard. March 23, 2016: “Giving and Receiving: By volunteering, retirees get the best of both worlds in feeling connected and worthy while doing good in their own community” by the Register Guard. May 1, 2013 radio interview of Ashton Eaton and Brianne Theisen on KUGN for the upcoming Champions for Children 6K Run/Walk. 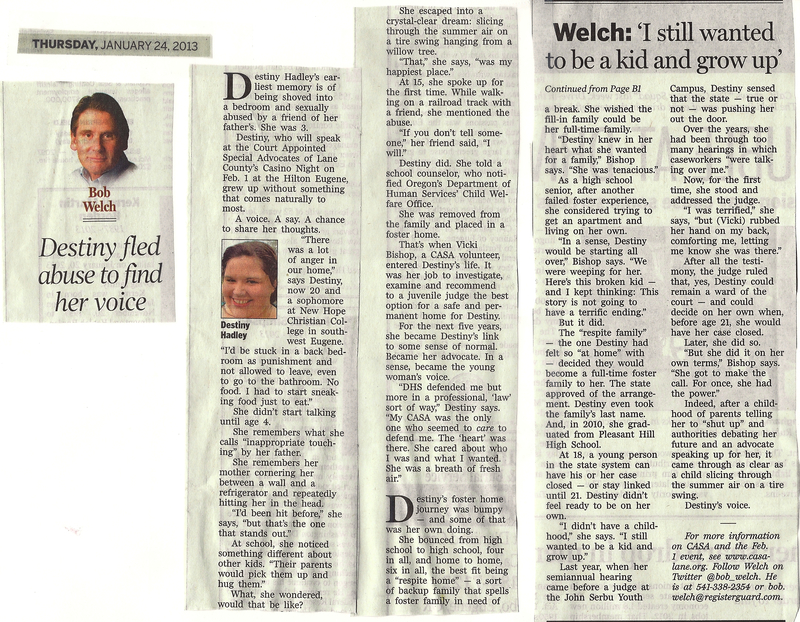 March 4, 2013: “Initiative Seeks to Protect Every Child” printed by The Register Guard.